Mountain Equipment Co-op updated their iOS app to version 1.1 in December which included search improvements and a handy barcode scanning feature. 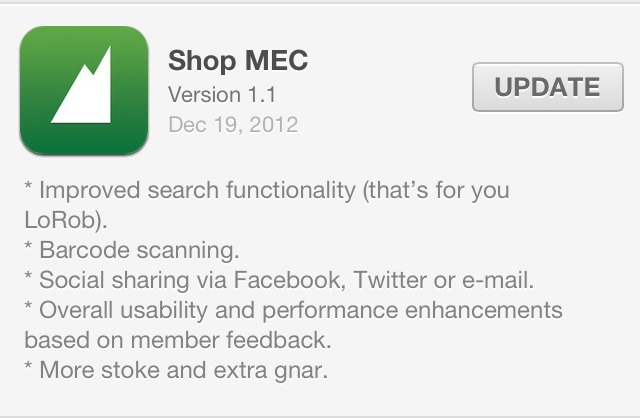 I popped in to MEC Toronto to give the update a try as well as update our run-through of the app itself. Just for fun I tried scanning a MSR fuel canister (with a concave barcode no less!) and the app handled it like a champ. Oddly enough I tried scanning a Whisperlite stove and it wasn't sure what it is. After scanning the barcode, the app brings you to the product page where you can read reviews, find out more about the product itself or even check stock at other MEC locations. Another new feature lets you share products via Facebook, Twitter or e-mail.